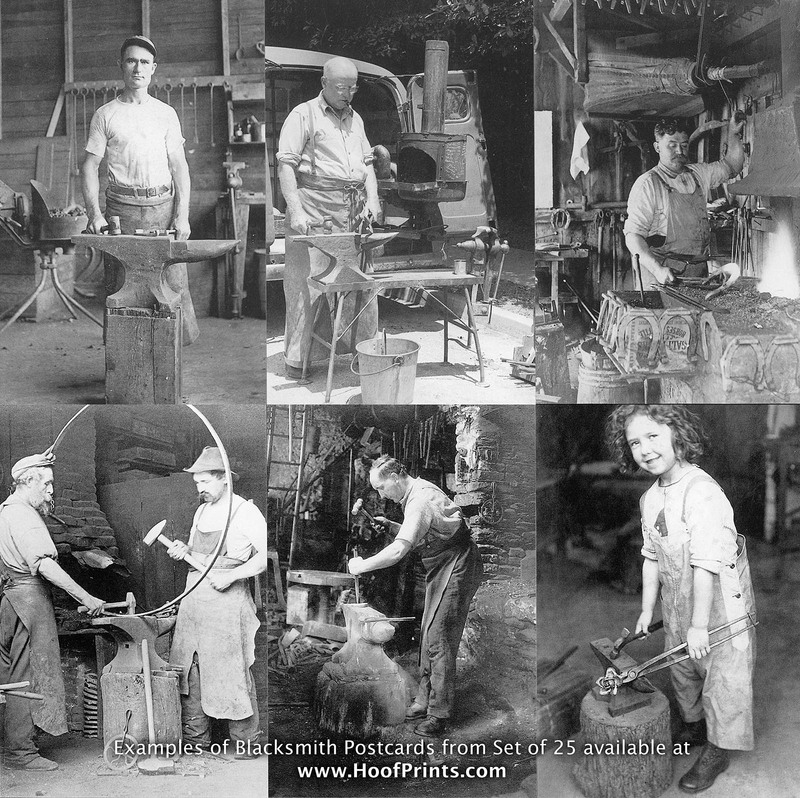 Reproduction of 25 different vintage images of blacksmiths at work. Only a few with horses. 3 1/2" x 5 1/2" printed on heavy card stock. "Single blacksmith postcards sell for much more than this on ebay - this is a great deal for anyone crafty to frame these up, make collages, do scrapbooks, etc. All the cool stuff I was planning to do with them when I got time. I've finally decided to move on and let them go. You can get inexpensive black frames at the dollar store, frame these up and hang them as a group on the wall in your den. Stick a couple worn-out tools up there, an empty Hooflex can and some horseshoes... you'll be as quaint as Cracker Barrel!" Postcard marked on front with Forging Class, The Berry School, Mt. Berry, GA.
Postcard showing man standing at anvil beside calking vise and empty light sockets hanging from the ceiling - L. A. Jorgenson, Lincoln, Nebr., C. A. 1919, Claim to Fame: Shoed 56 horses in a single day. Nothing available for the other postcards.